Before you head to the grocery, look inside your refrigerator. Plan your meals for the period between shopping trips, taking into account what you already have on hand. If you know some, or all, of your household will be eating dinner out on a given day, that is one less meal to plan. Write a shopping list based on recipes for the meals in your plan. For produce that ripens quickly, like avocados and bananas, buy some that are soft and ripe for immediate use that day and some that are still green and firm for use later in the week. Resist impulse purchases based on sales. With perishables, you don’t save money by stocking up when they’re cheap. You’ll just end up throwing more unused produce into the garbage or compost heap. Keep track of your leftovers. After eating your carefully planned meals, be sure to jot down how much of each item is left over. If the usual members of your household are at the table, you will develop a better understanding of how much you really need to buy next time. 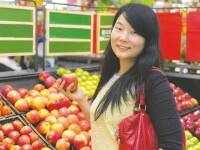 Shopping more frequently will really preserve produce. Instead of loading up the cart every week or so, make a commitment to shop for groceries at least two times each week. That way, your forecasts regarding what meals will be eaten at home will be more accurate. In addition, you’ll be able to choose the freshest produce and use it all before it goes bad. Despite the best intentions and planning, you will still find yourself with something in the crisper that will spoil before you need it. If a perishable food is still good and you know there is no way you will use it in time, freeze it. You can even freeze veggies that have become limp but are not yet rotten. Later, they can be used in soups and casseroles. Be sure to develop some favorite recipes based on using up these frozen treasures. When you prevent produce waste, you’ll also save money!